From Tuesday to Sunday, 09.00 a.m. - 08.00 p.m.
All items were collected by Sardinian magistrate Luigi Cocco. 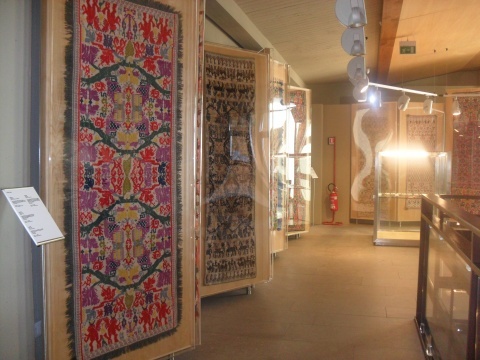 The Ethnographic Museum is a huge collection of refined Sardinian handicrafts. It is featured by an exhibition of textiles, jewels, furniture, utensils and carvings, dating back to the second half of 19th century and the first half of the 20th . All items were collected by the Sardinian magistrate and collector Luigi Cocco (1883 – 1959). The 731 pieces of the textile collection come from central and southern Sardinia and belong to the traditional horizontal loom: blankets, chest covers, table covers, cushion covers, bed ornaments, ornamental strips, tablecloths, towels, pot holders, saddle bags, animal collars. The collection also includes many jewels: 1266, mainly in silver. Although their origin and history is attested only in very few cases, they documented the major types of Sardinian popular tradition in clothing and accessories for women. These ornaments had also a strong symbolic value and a social differentiation, even in the case of magic protection amulets. Among artifacts and home decors,wooden crates have a considerable importance, large in size (Kascia or arka) and small( kascitta or kascioneddu), and they are highlight in any ethnographic collection in the island. They belong to the barbaric category and they are in chestnut wood and they have hinged lid. They are formed by wooden carvings with geometric, zoomorphic and phytomorphic decorations.